← Shall We Gather at the River? Prior to my trip to the Middle East, I’d heard a great deal about Hezekiah’s tunnel. With half interest, I listened about their adventures and formed a fantasy world in my mind. Hezekiah’s tunnel in fantasy world has a series of high arched bridges, loads of sunlight, smooth stones, a rippling stream of ankle-deep water, and perhaps a Disney-esque cast of singing birds. 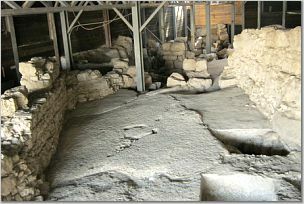 Ancient ruins before entering Hezekiah’s Tunnel. Photo courtesy of Rachel Greenawalt. Hezekiah’s tunnel in the real world is a shoulder-wide slit deep below the earth’s surface. Water depth rises at times to mid-thigh. No birds flit or fly. No sunlight brightens the way. To navigate the tunnel safely, you need a flashlight. I’d gotten the memo in an email but hadn’t noted this important detail. I walked into the dark with nothing more than my own shattered fantasy and the desire to stick close to the person in front of me. The dark hides dangers and delights alike. In the dark, you can’t see anything. Brilliant jewels embedded in rock may surround you. Shattered glass may litter your path. Who knows whether good or evil or nothing at all awaits you in the dark? The dark heightens fear. When you can’t see your surroundings, your imagination runs wild. Even the most pastoral of settings seems fraught with danger. I remember rising early as an adolescent to go fishing. None of my siblings would join me so I pedaled my way to the Guadalupe River alone. Five minutes standing by myself in the dark amplified the sounds of nature and my own fears. I hopped on my bike and pedaled my way home in record time. The light dissipates fears. As I said earlier, I had a strong desire to stick close to the person in front of me. Pam and I traveled the forty-five minute walk in tandem. If I had trekked alone without a light, I’d have been terrified. With the light, I feared nothing. The light illuminates dangers and delights alike. I didn’t see the beauty inside the tunnel because my eyes focused on Pam and her flashlight beam. But after we exited the dark confines, others talked about the marvelous things they saw along the way. While in the tunnel, people with lights warned of the dangers, those moments when the tunnel ceiling dropped and we needed to crouch to move safely forward. 1) Dark, evil, danger, or whatever other name you give it exists in our world. It comes in various forms—ignorance, greed, confusion, hatred, lust, etc.—and can grip us with an unyielding terror. 2) Light overcomes the darkness. It’s that simple. Even a small match when struck flares up and illuminates. The dark has no power to blow the flame out. How does that information change my world? The ONE offers us light in two forms—the example of His Son, our Elder Brother, and the UNSEEN PRESENCE who is here with us now. We can follow our Elder Brother and allow the UNSEEN PRESENCE to influence and empower our lives. If we do that, we become what Pam was for me in Hezekiah’s tunnel, bearers of light who overcome dark’s oppression. Question: What story can you share of bringing light into a dark situation? This entry was posted in Lessons from the Holy Land and tagged darkness, evil, good, light. Bookmark the permalink.